Milsons Point station lift is now upgrading from Sunday 18 February to Friday 8 June. To improve the service reliability, reduce the need for ongoing maintenance and enhance customer facilities, we will be upgrading the lift shaft and replacing old Lift with a new electronic lift. Lift provides access from concourse to platforms 1 and 2. There are stockpiles of materials built up on the approaches to Kings Cross & Edgecliff Stations, I guess the ESR stations are about to loose their individual identities. Rick R wrote: I guess the ESR stations are about to loose their individual identities. KX already got a substantial renovation and the grey tiles some time ago, and they restored some of the original column tiles. Suspect Edgecliff will get new tiles alongside the lift build, and Martin Place as part of the Metro build. Edgecliff Station is now upgrading. Milsons Point lift is upgrading until mid-September. Redfern has a new concourse under construction at the Gibbons St entrance. The new ticket gates at the Central Chalmers Street entrance are active. Tonymercury wrote: Redfern has a new concourse under construction at the Gibbons St entrance. 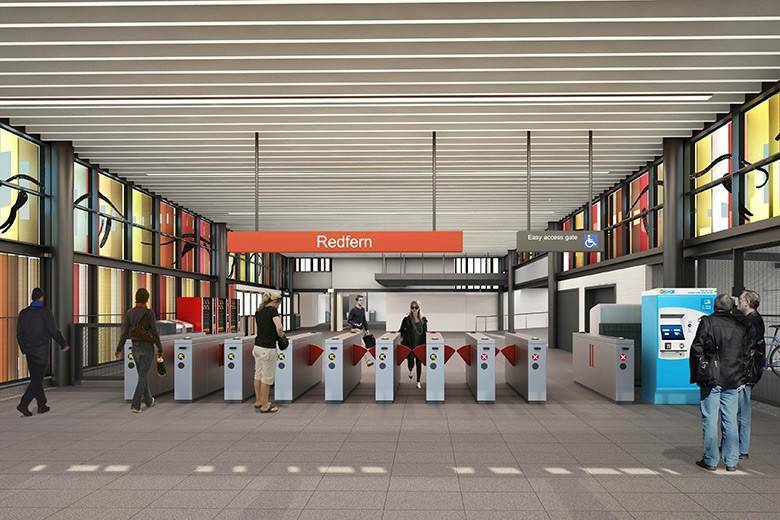 So Redfern is not getting Opal gate once they upgrade for concourse? TSE_SecretAni wrote: So Redfern is not getting Opal gate once they upgrade for concourse? That's a big assumption - I would suspect that there is going to be a better located new entrance, perhaps facing the intersection. Last edited by Tonymercury on Sun Aug 12, 2018 5:22 am, edited 1 time in total. The bulldust from the transport agencies is tiresome. As I see it, train passengers crossing Gibbons St. to and from Redfern Station will no longer have a ped. Xing aligned with Redfern Street, but will be forced to use the crossing at Lawson Street, increasing the walking distance by some 50 to 100 metres. Yet the blurb from the agencies says "The new entrance improves safety as customers will no longer have to cross a busy thoroughfare". Bulldust! My bet is that some smart alec traffic engineer has calculated that motorists will reduce their travel time by so many nano-seconds if the existing pedestrian crossing outside Redfern Station is removed. Because Gladys personally signs off on every pedestrian crossing and traffic light. Its a much wider entrance and the 2nd and 4th pictures (you need to scroll) show a gate line. Circulation space is more important than having an exit 20 metres more south, especially in a cramped station like Redfern. Agreed on the nanoseconds. RMS engineers always prioritize 10 vehicles over 50 pedestrians. As someone who uses Redfern several times a week, the exit positioning is a retrograde step. The current gate line next to the passage to the T4 platforms is retrograde. The Berejiklian government plans to sell land along rail lines in Sydney's inner south to pay for a $207 million upgrade of Redfern train station, leaked documents show. 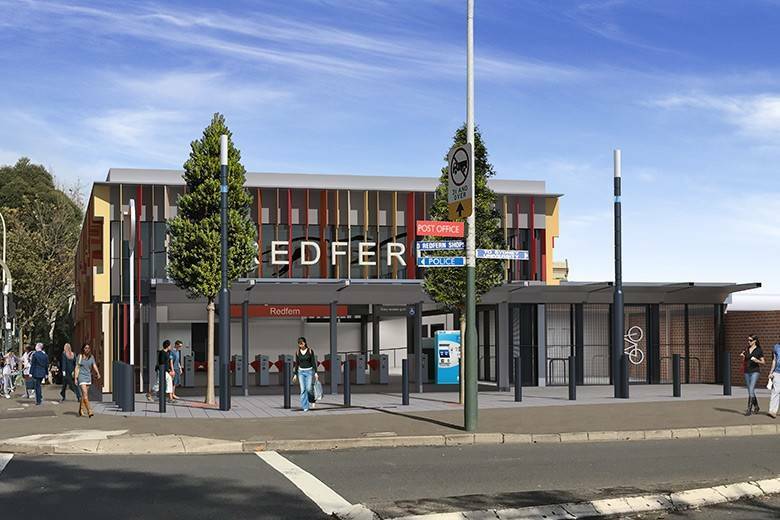 The long overdue upgrade of Sydney's sixth-busiest station is part of a much larger plan for a redevelopment of the Redfern-North Eveleigh precinct. “Sensitive” government documents, obtained by the Herald, reveal the state intends to fund the station upgrade by the “transfer and development of government land at North Eveleigh and Redfern”. The government owns about 12 hectares of land in the Redfern area, including the Carriageworks site at the old Eveleigh rail yards. The documents, dated March this year, reveal the plans to sell land at Redfern and North Eveleigh will be confirmed during a “market-led process” to redevelop the precinct around the station. The government wants to announce the preferred developer for the precinct redevelopment next year. The state's lead transport agency has estimated the cost of the station upgrade at $207 million, the documents show. This is referring to an additional upgrade, not just this entrance brush-up. With $207m you'll be able to build a brand new main concourse! swtt wrote: This is referring to an additional upgrade, not just this entrance brush-up. Yes I know. The reason I don't think the new Gibbons Street entrance is that big a deal is because there would be a new side entry nearer to Marian Street with a new concourse running mid-platform. From Saturday 1 September 2018 until late 2019 Parramatta Station’s Darcy Street exit will be closed for station improvement works. Alternative entrances will need to be used to access the station. The Darcy Street entrance, including lifts will be closed. The Argyle Street entrance next to the A bus stands will be entry only during peak times. Peak times are from 7am to 9.30am and 4pm to 6pm weekdays. During peak times when you cannot leave from the Argyle Street exit you will be directed to the alternative Westfield exits. Signs will be in place to guide you. Allow for up to 4 minutes additional travel time to access alternative exits. All other entrances and lifts at Parramatta Station remain unchanged. While the new entrance is a welcome addition, the main congestion at Redfern comes from Sydney Uni students taking the regular Lawson each afternoon there can be so many trying to squeeze through the tiny 2 or 3 person wide opening that the congestion blocks the footpath and people are just standing in the middle of little eveleigh Street. Maybe one day the old Wilson Street entrance may return! Some (temporary?) improvements (?) at Lawson Street entrance while the other entrance is closed. The attendants box at the entrance was Removed a few weeks ago, but in its place are some double sided opal reader poles (not gates). The old side entrance to Little Eveleigh Street is open with two single opal poles (a long long long time ago this used to be a metal turnstile for entrance only). This entrance is already proving to be very busy as the quickest for Sydney Uni students. Lots of crowd control barriers on the concourse trying to direct flow. REDFERN STATION - ENTRANCE UPGRADE AND INTERCHANGE. I'm not sure there's a connection, but the removal of the pedestrian crossing in Gibbons Street, (opposite the old station entrance and aligned with Redfern Street) apppears to have enabled the opening of a new inbound bus stop in Gibbons Street, about 20m south of the station entrance. For the record, lobbying for better access to the station for passengers off inbound 309 buses has been going on since at least December 2015, when the nearest inbound 309 stop, in Lawson Square, was closed. Set-downs then moved to Redfern Street, ever further from the station. The new stop in Gibbons Street (from 30.7.18?) is most welcome. The current bus stop arrangements on Gibbons St at Redfern Stn are: L09-IN PM set down stop opposite Redfern St and 308-IN/OUT AM & PM peak terminus pick up and set down opposite Marian St. The relatively new elevator at Kings Cross is closed for September for renovations. Work has started at Edgecliff on the elevators with platform sections now blocked off. moa999 wrote: The relatively new elevator at Kings Cross is closed for September for renovations.